Poore’s Propane & Oil installs a line of aesthetically pleasing fireplaces, gas log sets and fireplace inserts from Empire. We have a dedicated team available to help you make your selection. There’s something special about the warmth and ambiance that a fireplace brings to a living space. A propane gas fireplace will give you that real flame experience—and much more. Propane gas fireplaces can be installed indoors or out and they are more efficient and better for the environment than wood-burning models. They also deliver as much as six times the heating capacity of an electric fireplace. If you have an old wood fireplace, it’s easy to convert it to a clean-burning and safe fireplace gas insert. With a fireplace that runs on propane gas, you’ll never have to get up and put another log on the fire or wait to make sure the fire is extinguished before you go to bed or leave the house. You’ll help the environment, too, because propane burns much cleaner than wood. 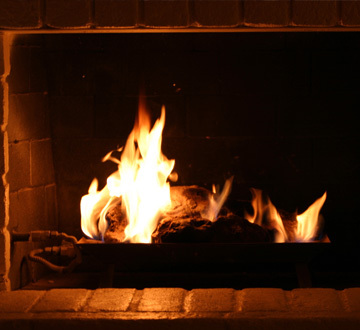 A wood-burning fireplace can produce 4,000% more emissions than a propane unit! A fireplace gas insert or free-standing gas fireplace provides supplemental heat for your home. Traditional wood-burning fireplaces use an open damper, which allows large amounts of heat to escape. Sealed propane gas fireplaces keep more heat radiating into the room—without any ashes and other mess to clean up. Contact the experts at Poore’s to learn more about propane gas fireplaces.